Kick back, put up your feet and relax with the stunning, exotic style of this Giraffe ottoman from our Safari Collection. With ample storage found within, this ottoman offers both lasting style and a place to store toys, blankets, throw pillows, and other accessories. 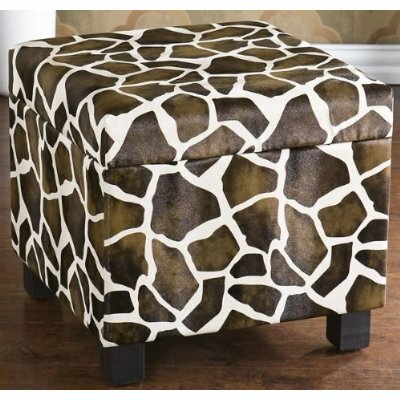 This stylish stool is upholstered with rich faux leather in your choice of animal prints. The lined interior is a perfect place for storage. Take a walk on the wild side and enjoy this functional and fashionable accent piece of furniture! * Sturdy frame provides years of lasting use. * Your choice of exotic, faux leather upholstery in Giraffe, Zebra and Leopard Animal print, offers a customized look and long-lasting beauty. * 15.5″H x 16″ square. * No assembly required. Made of faux leather, wood and MDF. For indoor use only.